A beautiful Saturday on the Chicago River. New boat house in Bridgeport less than a year old. The last day of September 2017. Recovery On Water (ROW) no longer heading to Green Bay for the weekend to race meant that we could consider participating in the 6th running of Chicago’s Tough Cup. A 5000 meter race…over 3 miles…and I was one of the 8 who raced in both a 4 and an 8 woman boat. On our home course. 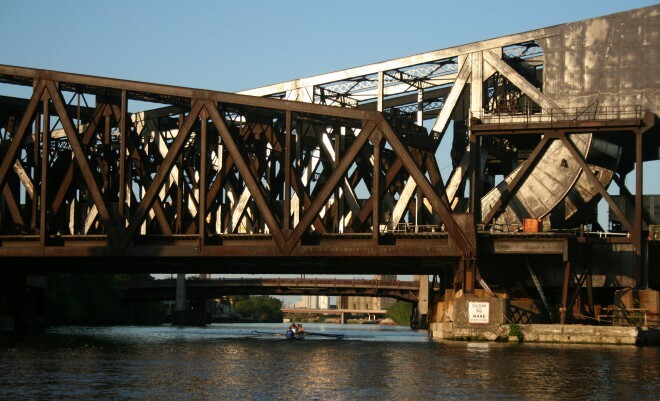 A home course where a couple of weeks ago one of the Chicago River’s tug boat captains had Billy Squire’s “The Stroke” blaring over his speakers to serenade us as we rowed on past. 20,000 meters of rowing, 50% of that in race mode. And such a fun, supportive team I belong to!!! Our coaches, coxswains and teammates were out in full force. This entry was posted in Action & Activism, Living Life Fully and tagged ROW. Bookmark the permalink.